I want to pay a warm tribute to Kenyon Wright who died last month. He is probably best known for having chaired the Scottish Constitutional Convention, which led to Scottish devolution. But I knew him through his association with Coventry Cathedral, where he spent 11 years from 1970-1981. For most of that time he led Coventry’s international reconciliation work, and formed the international Community of the Cross of Nails. Coventry remained important to him. He retired to the Coventry area, and in 2012 published his own account of Coventry’s reconciliation ministry, as Coventry – City of Peace. He said it was one of the greatest adventures of his life to share in the Coventry experiment. In his book he quotes my own remark that ‘the most inspiring story I know of how the church can respond to the needs of the world is the story of the ministry that developed around the rebuilt Cathedral in Coventry’. 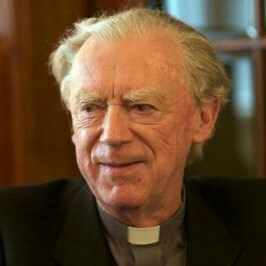 He was also quick to see the importance of the ecological crisis and was a key figure in organising the 1975 conference on Ecology and Christian Responsibility, under the auspices of the Community of the Cross of Nails. His talk at that conference on The Human Predicament Today remains powerful and inspiring. He was able to attend another conference on the environmental crisis at Coventry in the autumn of 2015. I remember the conversation I had with him there, in which we agreed that the key theological question was what God was saying to humanity through the ecological crisis. We posed the question, but neither of us answered it. But a couple of hours later, when Kenyon had the microphone for 5 minutes, he returned to the question and gave his answer, that God is saying “sort your relationships out, or else”. That is a good answer to much of what is going on with many troubling events in the world today. Though Kenyon was frail and elderly, he still had as much fire in his belly as anyone at the conference. The last time I saw Kenyon was at the premiere of the film in which the six Canons who have been responsible for reconciliation work at Coventry are interviewed. The others are Paul Oestreicher, Andrew White, Justin Welby, David Porter and Sarah Hills. At the end of the discussion that followed the film Kenyon stood to pay a brief but moving tribute to Provost Bill Williams, a towering figure to all who knew him, with a remarkably big vision of how to be the church in the world. As Kenyon says, Bill was demanding and uncompromising, but Kenyon was in no doubt about the debt of gratitude he owed him. There will be a memorial service for Kenyon in Coventry Cathedral at 3.00 pm on Friday 3rd March.